4 Cleaning pads. Color: as picture show. It has an easy-to-use design which utilises a quick mop head release system that ensures you'll never need to touch a dirty mop head again. This mop has been specially designed for rough, textured and safety flooring with its extra hard cut pile brush fibres. If you have a large surface and you need to clean the floor fast, the Addis Superdry Mop is a great choice. • For use with the Addis Superdry mop system. The Superdry head features an antibacterial sponge which reduces odours and prolongs the mop life. Compatible with the iRobot Braava Jet 240/241 Mopping Robot. Washable and reusable, uses water only and contains no detergents. Triple-pass cleaning in an efficient, systematic pattern tackles dirt and stains. For use on well-sealed floors such as hardwood, tile, and stone. Paste cleaning cloth design, more convenient remove and cleaning. Material fabric Color blue Size(each pack) about 185 x 70mm Type Replacement Mop Pad Room Home Office/Study Main Colour Blue Unit Type Unit Brand Unbranded/Generic MPN HD095509648532 EAN 0762876515155. FLAT MICROFIBRE MOP REFILL FOR ELLIOT MOP. USE WET - GET THE MOP MICROFIBRE CLOTH, LET IT DO ALL HE CLEANING, AND THE GIVE IT A GOOD WASH. USE DRY - LET THE MOP MICROFIBRE CLOTH DO ALL THE CLEANING, THEN GIVE IT A GOOD SHAKE OUTSIDE AND EVERY NOW AND THEN GIVE IT A GOOD WASH.
Made of thick stainless steel and PE, this mop is durable and solid to use. It can spray water by pressing handle effortlessly, microfiber head will do no harm to your floor, suitable to use on tiles, wood/hardwood/laminate floors, lino. But giving us a chance might change your perception and experience. QUALITY - 100% machine washable and reusable. DURABLE & LONG LASTING - Fastening strip underside of your mop, the refill pad can attach to a Spray Mop within seconds. 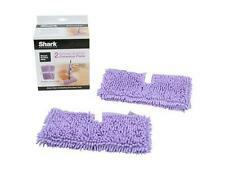 Compatible with the iRobot Braava Jet 240/241 Mopping Robot. Washable and reusable, uses water only and contains no detergents. Triple-pass cleaning in an efficient, systematic pattern tackles dirt and stains. For use on well-sealed floors such as hardwood, tile, and stone. Paste cleaning cloth design, more convenient remove and cleaning. Material fabric Color blue Size(each pack) about 185 x 70mm Type Replacement Mop Pad Room Home Office/Study Main Colour Blue Unit Type Unit Brand Unbranded/Generic MPN HD095509648532 EAN 0762876505163. 2 Mop cloth cover. When the sweeping robot is working, clean the floor. High water absorption, strong decontamination, no hair removal, long life, easy to clean. Color: White(As Pictures Show). Made of high quality material, more durable. 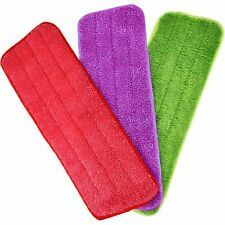 4 Cleaning pads. Color: as picture show. The real color of the item may be slightly different from the pictures shown on website caused by many factors such as brightness of your monitor and light brightness. Comes with: 2 - soft pads 2 - scrubby pads. Fits Bissell 2039 series, model #2124 No returns, no international shipping! Washable and reusable. 4 Cleaning pads. The real color of the item may be slightly different from the pictures shown on website caused by many factors such as brightness of your monitor and light brightness. Household mop-use in bathrooms and kitchens. 8 ply cotton with no blue cord. No Hang Hook. Soak in water for 12-24 hours to break in. We aim to respond via all channels within 24 "working" hours. Due to our massive buying power and huge warehouses, we are able to secure great clearance deals at heavily reduced prices passing on these great savings to yourself. Compatible with the iRobot Braava Jet 240/241 Mopping Robot. Washable and reusable, uses water only and contains no detergents. Triple-pass cleaning in an efficient, systematic pattern tackles dirt and stains. For use on well-sealed floors such as hardwood, tile, and stone. Paste cleaning cloth design, more convenient remove and cleaning. Material fabric Color blue Size(each pack) about 185 x 70mm Type Replacement Mop Pad Room Home Office/Study Main Colour Blue Unit Type Unit Brand Unbranded/Generic MPN HD095509648532 EAN 0095509660718. 2 Green Mop cloths. 2 Red mop cloths. Can be safely used in flooring, hardwood, ceramics, stone, ceramic tiles, concrete and linoleum. Material:Microfiber. High water absorption, strong decontamination. Our microfiber spray mop pads can be safely used on laminate, hard wood, ceramic, stone, tile, concrete and linoleum. They ar not easy to wash broken and they won't have farbic loss.You can wash them in the washing machine, which is more convenient. 配适于 Light 'n' Easy model S7338, S7339(第三方产品). 数据为均手工测量,可能存在些许偏差,但不影响使用. 所有图片都经过专业校色,但由于所在环境光线以及不同显示设备设置不同,你所看到的图片和物品本身或许存在些许偏差,敬请谅解. Compatible with the iRobot Braava Jet 240/241 Mopping Robot. Washable and reusable, uses water only and contains no detergents. Triple-pass cleaning in an efficient, systematic pattern tackles dirt and stains. For use on well-sealed floors such as hardwood, tile, and stone. Paste cleaning cloth design, more convenient remove and cleaning. Material fabric Color blue Size(each pack) about 185 x 70mm Type Replacement Mop Pad Room Home Office/Study Main Colour Blue Unit Type Unit Brand Unbranded/Generic MPN SY095509660619 EAN 95509660619. Compatible with the iRobot Braava Jet 240/241 Mopping Robot. Washable and reusable, uses water only and contains no detergents. Triple-pass cleaning in an efficient, systematic pattern tackles dirt and stains. For use on well-sealed floors such as hardwood, tile, and stone. Paste cleaning cloth design, more convenient remove and cleaning. 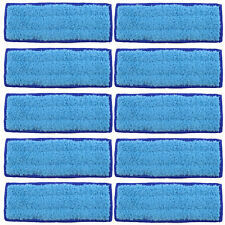 Material fabric Color blue Size(each pack) about 185 x 70mm Type Replacement Mop Pad Room Home Office/Study Main Colour Blue Unit Type Unit Brand Unbranded/Generic MPN HD095509648532 EAN 0095509648532. Can effectively clean the dust in the floor crevice. 6 Mop Pads. Adopts hook & loop fastener with elastic opening, directly fits. Adopts 2 sides design, can effectively attach and lock in dirt on floors. Vileda Magic Mop Flat Refill Pack of 3 - Household deal. Vileda Magic Mop Vileda Magic Mop Refills Vileda refills flat mop refills flat magic mop. Personal Care. New Peppa Pig Recorder with Case Assorted colour. 2 Green Mop cloths. 2 Red mop cloths. Can be safely used in flooring, hardwood, ceramics, stone, ceramic tiles, concrete and linoleum. Material:Microfiber. Easy to clean. Note:The real color of the item may be slightly different from the pictures shown on website caused by many factors such as brightness of your monitor and light brightness. 2 Green Mop cloths. 2 Red mop cloths. Material:Microfiber. High water absorption, strong decontamination. Easy to clean. Note:The real color of the item may be slightly different from the pictures shown on website caused by many factors such as brightness of your monitor and light brightness. Vileda Easy Twist Replacement Pad - BNIB. Condition is New. Packaging slightly damaged (see pics). Dispatched with Royal Mail 2nd Class. 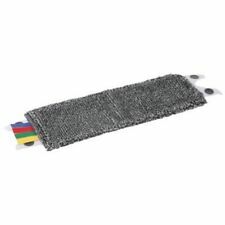 As the mop head moves over your floor, the cleaning pad’s top sheet allows the dirt and water inside the pad while the super absorbent core locks it deep inside. By locking away the dirt and water as you mop, the pad surface stays clean and nearly dry. Universal Fit, Stick it on the board of the mop. 1 Mop Head. Floor Maintenance Material: Microfiber. Ideal for wet floor cleaning such as stone and tile floors. Microfibres remove the most stubborn of floor stains and absorb grease and dirt.